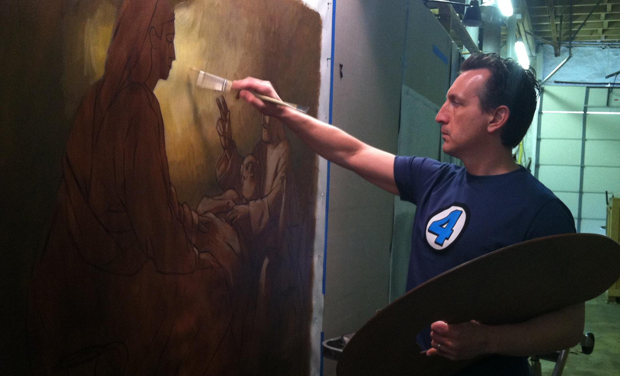 Neilson Carlin of Kennett Square works on a scene depicting the life of the Holy Family in a commission for Sacred Heart Parish, Royersford. Kennett Square artist Neilson Carlin has been commissioned to create what may be one of the most important and personally satisfying paintings of his career. It will be a four-by-five-foot oil on canvas of the Holy Family – Mary, Joseph and Jesus as a small child painted specifically for the Eighth World Meeting of Families, which will be held in Philadelphia Sept. 22-27, 2015. It is expected to be completed by Sept. 1, and will be featured in various materials connected with the meeting and ultimately displayed at the Cathedral Basilica of SS. Peter and Paul. A 1992 graduate of the University of the Arts in Philadelphia with five years’ private study with Michael Aviano in New York, he has built up a reputation as a serious artist through numerous exhibitions and commissions. Over time he has gravitated to sacred art to the point where it is now most of his output. Carlin stands in his studio before his paintings of St. Gianna Molla (left) and Blessed Miguel Pro. A highlight for him was a 2007 project for the Shrine of Our Lady of Guadalupe in La Crosse, Wisconsin, where over 14 months he executed multi-figure paintings of St. Gianna Molla and Blessed Miguel Pro as well as Saints Therese of Lisieux and Peregrine Laziosi. The latter two were done in collaboration with his friend, South Philadelphia artist Anthony Visco, whose best known local works are at the Shrine of St. Rita on South Broad Street. “Tony has been my mentor. He taught me art is a vocation,” he said. 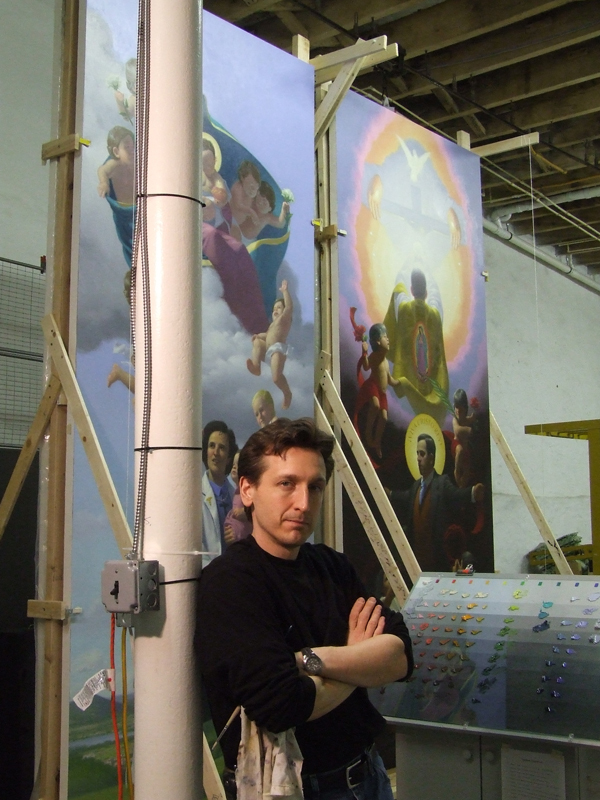 Locally, Carlin has executed paintings for Sacred Heart Church in Royersford; St. Rocco in Avondale and Our Lady of Guadalupe in Buckingham, where he also collaborated with Visco. Click to see a larger image of Carlin’s “Blessed Miguel Pro” painting. 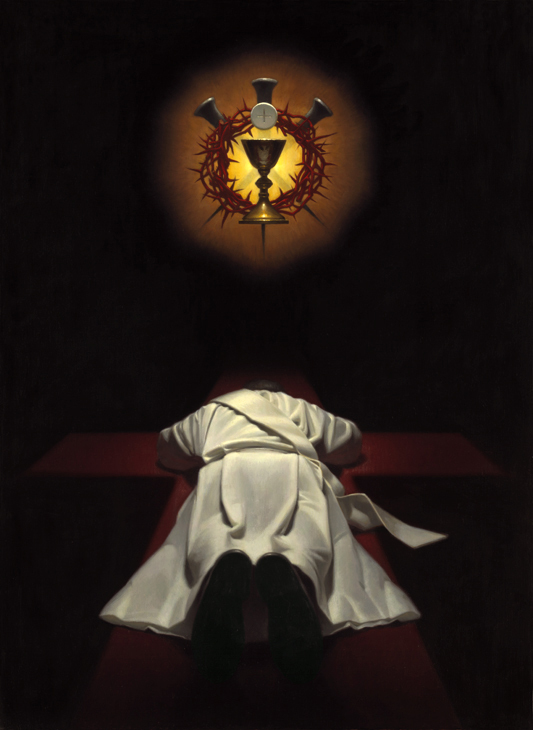 While sacred art, especially Catholic sacred art, has become dominant in his work, it was not always so. Carlin was baptized Catholic as an infant but raised in various denominations including Lutheran and Evangelical churches, and as is often the case, in his college years he drifted away from the practice of religion entirely. He credits the strong cradle-Catholic faith of his wife Colleen and her family as a first step for him on the path to eventual reconversion to the religion of his birth. Through attending church at St. Thomas the Apostle in Glen Mills he fell in love with the Mass. “The old stereotypes about Catholics fell away,” he said. Also he and Colleen agreed their children (now three — Finn, Moira and Eamonn) would be raised Catholic. Because of this Carlin decided to enter the RCIA program at St. Thomas Parish. This was done not necessarily to become Catholic but at least to understand what it is all about. Then-pastor Father Richard Williams and Deacon Charles Devine at St. Thomas were patient teachers, and slowly Carlin came to see what he must do. It was at a Mass in the year 2000 when Father Williams preached a powerful homily on the seed that fell on fertile soil – also the Gospel reading for this Sunday, July 13. “I broke down in tears, it is the only time I heard God’s voice,” Carlin said. After this he made his final decision and he was received into the Catholic Church at the Easter Vigil. That was a turning point in his life and his art. 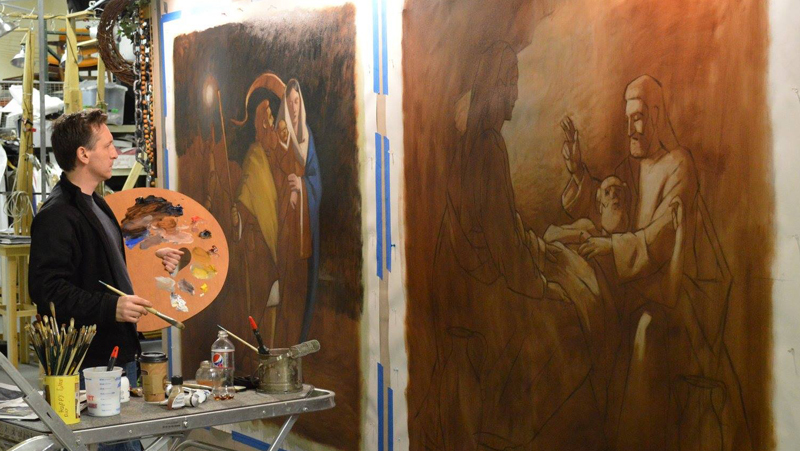 Carlin continues work on his paintings of the Holy Family. I am sure Sister Paula from S. Philly is pleased with Neilson’s success. I pray for her every day. I look forward to seeing his work. Terrific article. Oh, your work is so beautiful! Definitely inspired of God. Go forward with this mission of yours to capture the spirit of God in your paintings. Love them so much. We need them in this world ever so much. God bless you and keep you. Catholic Philly.com thank you for publishing this wonderful article on a great local sacred artist. There are many more. I hope you will also consider interviewing other local Catholic artists for instance, Anthony Visco and Renee Foulks. Thank you for this article. I too see my art as spiritual. I do not paint the Holy Family but the scenes of nature show the creativity of God in my work. I look forward to seeing the piece at the World Meeting of Families. May God continue to bless you in your calling….